Enhance a variety of recipes in seconds introducing a fresh twist of basil, cheese, and garlic. It's amazing what a little pesto can do! Serve this dip as a tasty appetizer for your next backyard gathering. Basil pesto is combined with a delicious cheese trio: ricotta, provolone, and cream cheese. Enjoy it warm with breadsticks or chips! This colorful main dish gets a fresh-from-the-garden taste with the addition of our basil pesto. Skewer red peppers, yellow squash and zucchini alongside pieces of chicken for a perfectly grilled dish. Bonus: You can use whichever veggies your friends and families love! Make pizza night more exciting! Add our basil pesto to give a burst of flavor to your traditional tomato & mozzarella cheese pizza. 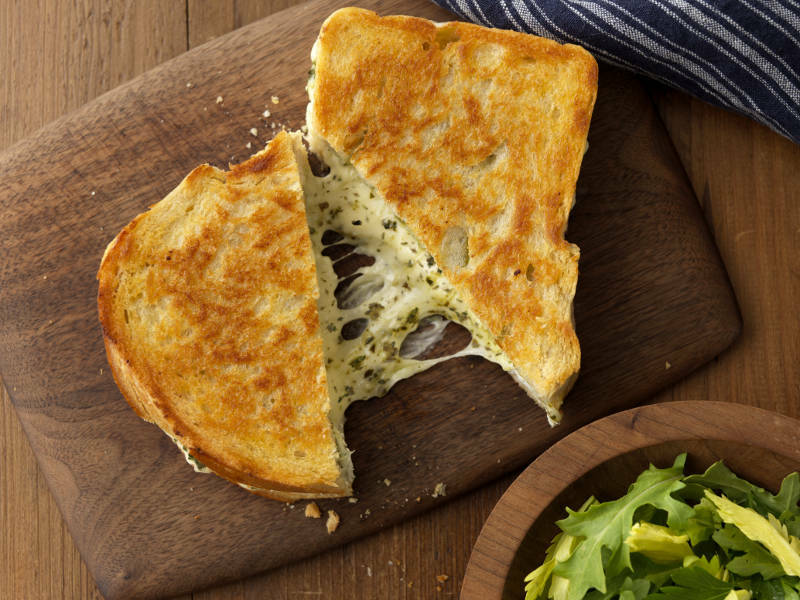 Add a fresh twist to a family favorite by spreading basil pesto on your grilled cheese. The delicious combination of melted cheeses and basil pesto will deliver a burst of flavor in every bite! A perfect appetizer for those who like to crunch! Try this toasty bread topped with pesto, cherry tomatoes, squash and feta cheese at your next gathering.